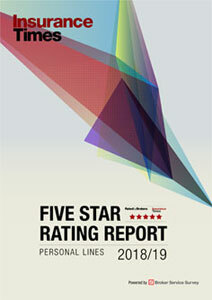 Markel received a Five Star rating from its brokers in the revamped Broker Service Survey from Insurance Times, coming second overall with a score of 4.04 out of five. Markel UK divisional managing director Neil Galjaard says the rating is testament to the hard work the insurer has put in to build strong relationships with its brokers and offer a specialised service that can be passed on to the end client. “We are really pleased to get the Five Star rating, and I think we have worked really hard to ensure that we build strong relationships with brokers,” he says. “We’ve always been recognised as a quality insurer, but I don’t think we are as well known for the range of capabilities that we actually do have, and I think that is increasingly being recognised and it is now appreciated that we deliver real specialism for a sector, and that then enables the broker to deliver a more complete service for their clients. Access to decision-makers is a key service sector in the Broker Service Survey, with Markel coming second in the rankings with a score of 3.98. Galjaard says this is important for brokers because it allows them to get answers quickly and better service their clients. “Having easy access to decision-makers is important for brokers because they are looking to engage with a knowledgeable member of the team, and someone who can resolve the issue or give an immediate decision,” he says. “Brokers don’t have the time to wait for a full but maybe somewhat delayed response, because they are often working to quite tight deadlines with client renewal, and having that access is what brokers need. Galjaard says that Markel is aided in this regard by an experienced team of underwriters that are specialised in their particular product line. “We have a team of very capable underwriters and very experienced people who have worked in Markel for many years, and we have underwriters out in our regional offices around the country who support brokers locally,” he says. “All of our underwriters are overseen by the technical line managers for each product line, and each of those has at least 15 years experience in that particular specialism, so they have the knowledge and flexibility to be able to look at risks individually when things get referred to them. Despite its strong performance, Markel is always looking to improve and looks to learn from its brokers a every opportunity, both through internal surveys and market reports such as the Insurance Times Broker Service Survey. “Broker feedback is vitally important,” Galjaard says. “One of the things I enjoyed reading in the Insurance Times Broker Service Survey report is how brokers are recognising in the verbatim comments how we are positioning ourselves differently in the market as providing sector solutions, and the fact that we offer wider consulting services, tax services and legal services that compliment the pure insurance offering. Some of the feedback received from the wider Broker Service Survey is that brokers are concerned about the disruptive threat of aggregators in the commercial lines market, something that Galjaard says insurers need to work with brokers on in order to avoid losing ground to the price comparison websites that have come to dominate in personal lines. “Some simple commercial risks may go online where the premiums are small and more akin to personal lines, but customers will still look to brokers for the advice they provide to make sure they are mitigating the risk properly,” he says. “Brokers can differentiate themselves around the whole service element, and they need support from insurers in doing that, which is why our approach to underwriting and claims, supported by our own tax and legal people is, I hope, more attractive to brokers. Looking to Markel’s future, Galjaard says it is important that the insurer continues to deliver the service its brokers have become accustomed to, but also invest in new products and services that can help brokers grow their own business and deliver a better service to the end client. 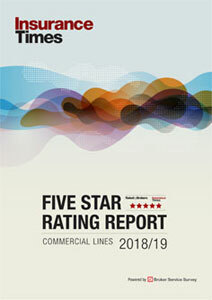 “We have to recognise that the Five Star rating is the result of thoughts and actions over a period of time and so we need to continue to deliver in the way that we have previously, and that is about being a team that is recognised for expertise, access to the right people and transparency in our communications,” he says. “Our care sector proposition has been really well received and we continue to develop new sector propositions that bring together those services around tax, insurance and legal consulting, and will do more of that, which will provide more differentiated offers for brokers.